Where do sapphires come from? In ancient Hindu texts, they come from the vanquished body of the demon Bali. Ancient Persians believed that they were chipped from the pedestal that supported the Earth, and whose reflection gives the sky its color! While these claims have yet to be validated, there ARE indeed some stones which can be traced back to their origins. While it may seem like quite a trek from the suburbs to the city during rush hour, odds are that the glittering sapphires in your ring had to travel much, much farther than that to be worn stateside. 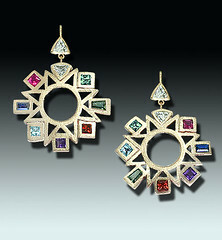 Here at the Eve Alfillé Gallery & Studio, the sapphires that we use have come from all different corners of the Earth! Often, these lovable gems’ origins can be determined in part by their color. Now, not all sapphires are blue! Even though it is the most well-known of sapphiric colors, they come in an entire rainbow, and are known as “fancy sapphires” whenever they are not blue. 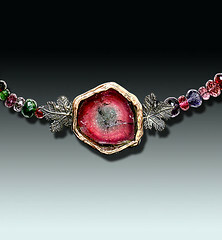 Rubies, of the same ‘corundum’ mineral as sapphires, are only the very reddest selection. 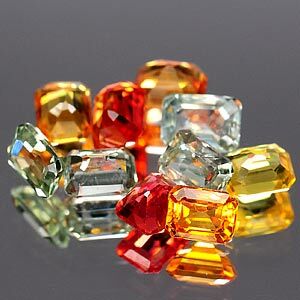 Other beautiful reddish shades of sapphire, however, are imported from Thailand, which can also produce yellow-green sapphires. Also from Asia come Sri Lankan blue and red-purple sapphires. Moving into the southern hemisphere, you’ll find Kenyan green sapphires, and a whole bevy of Madagascar sapphires: green-blue, blue, red-purple, golden, and green-yellow. Tanzania is a veritable font of sapphires, coming primarily from two separate regions; Tundura, home of six different color varieties of sapphires including green-blue, blue, blue-purple, purple, red-purple, and yellow, and Songea, which produces orange-red and yellow-green sapphires. 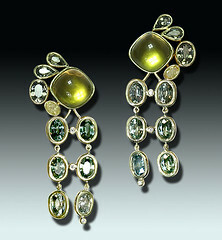 Farther south still, Australia produces green and green-yellow sapphires, mate! Finally, back in the states, Montana is known for its beautiful green and green-blue sapphires, some of which Eve has even mined herself! So the next time you’re feeling a bit of wanderlust, rather than booking a plane ticket, come by the gallery and you’ll be sure to see an entire world of sapphires!